So when we bought our house four years ago, it had not been lived in for eight months. Everything was a bit run down and just generally not in the best shape. The bones of the house were solid, but the space needed a deep reset and some serious character added. However, one of the things we loved most about this home was the living space. 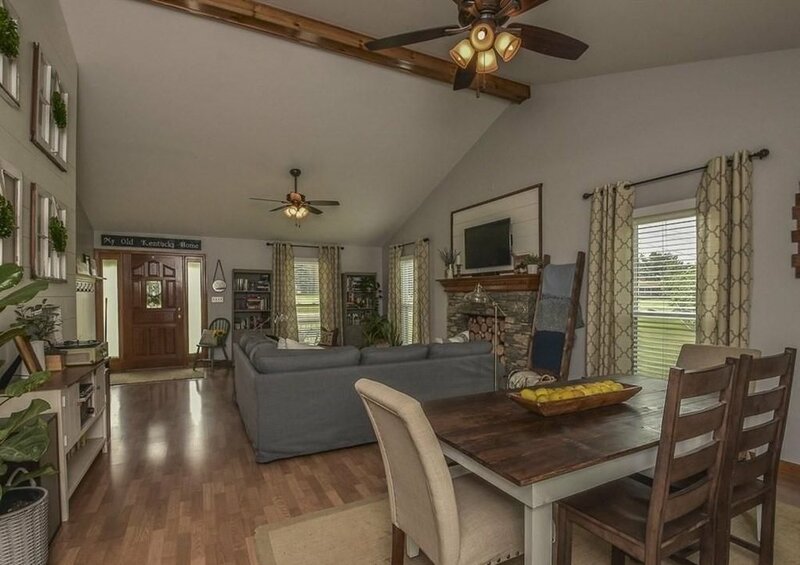 The living/dining area is a large, open space, with a vaulted ceiling, a giant wooden beam, and a big fireplace. 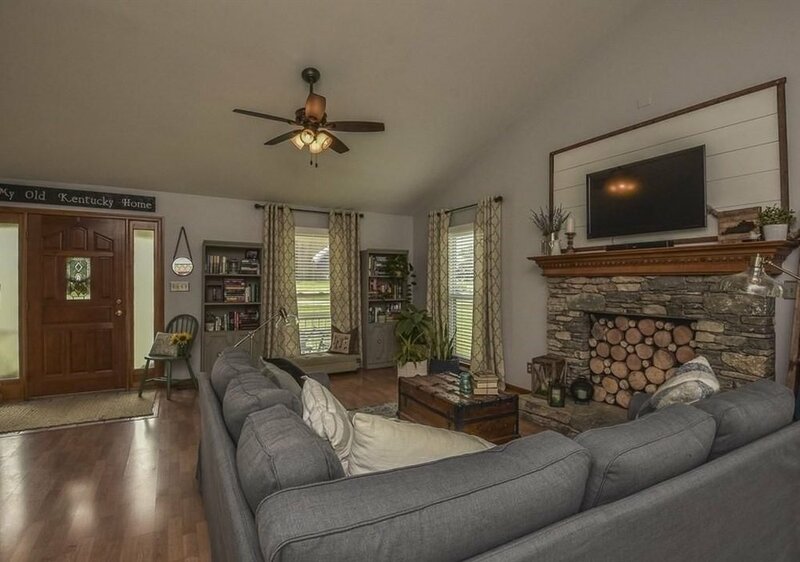 This is truly the room that sold us on the house. It just needed some accents to complete this awesome room! So you can see here from these pictures, that before it was just a blank canvas. 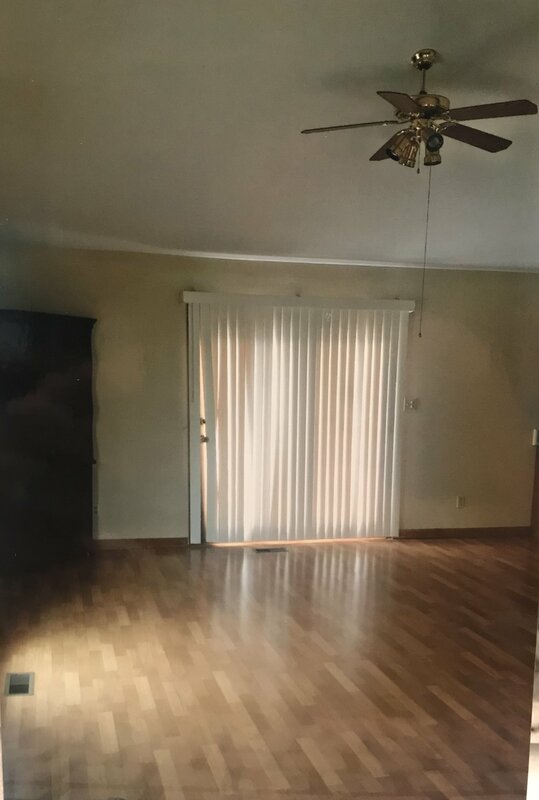 The ceiling fans were dated, obviously the vertical blinds were something else, and it just really didn't have anything that gave it that wow factor. Having a landing space for when people came over to set their things made such a difference. 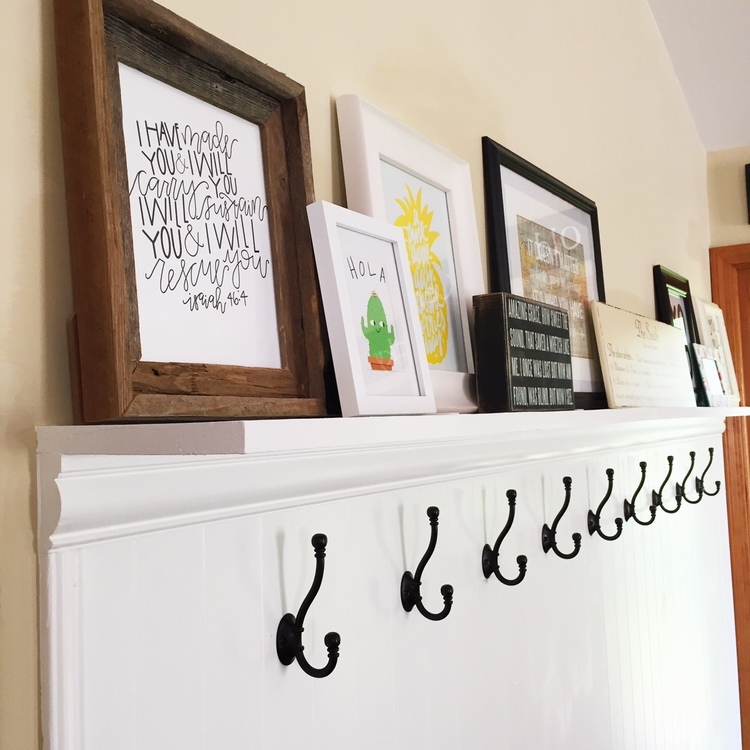 Even though we didn't have a formal foyer, or coat closet, right off the entry, all of these hooks and a place to throw bags was perfect. Plus it gave me an awesome shelf to put all my signs. Definetly need to find a space to have a shelf like this in the new house. This shiplap wall is another favorite. We took a seemingly awkward wall, and were able to turn it into a huge focal point. I will say, the rooms with 90 degree angled walls that weren't vaulted, were far easier, but we were able to figure it out, and I think it was definetley worth it. After doing the shiplap wall, the fireplace almost seemed small compared to the opposite wall, so I used some of the wood scraps I had to create a frame of sorts above the fireplace. I don't love TV's above mantles, but this made me like it a lot better! 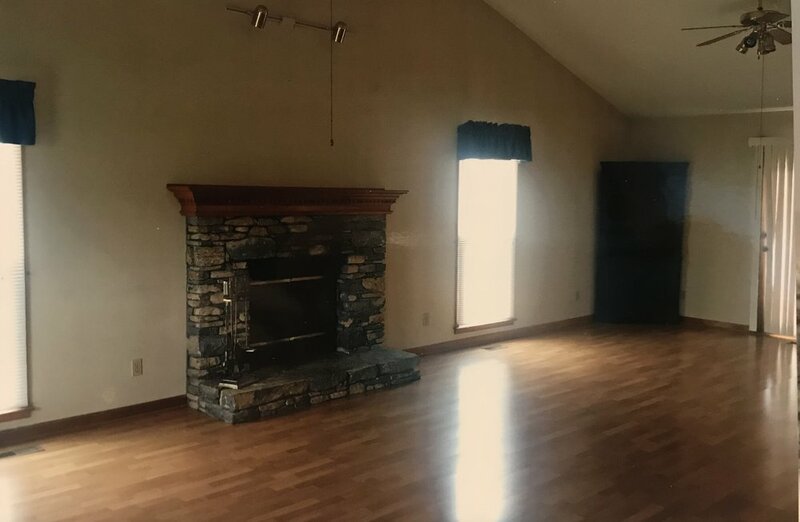 Our new house doesn't have a ton of space above the mantle so we won't be putting the tv there (pumped), but now I have to figure out where in the world it WILL fit! 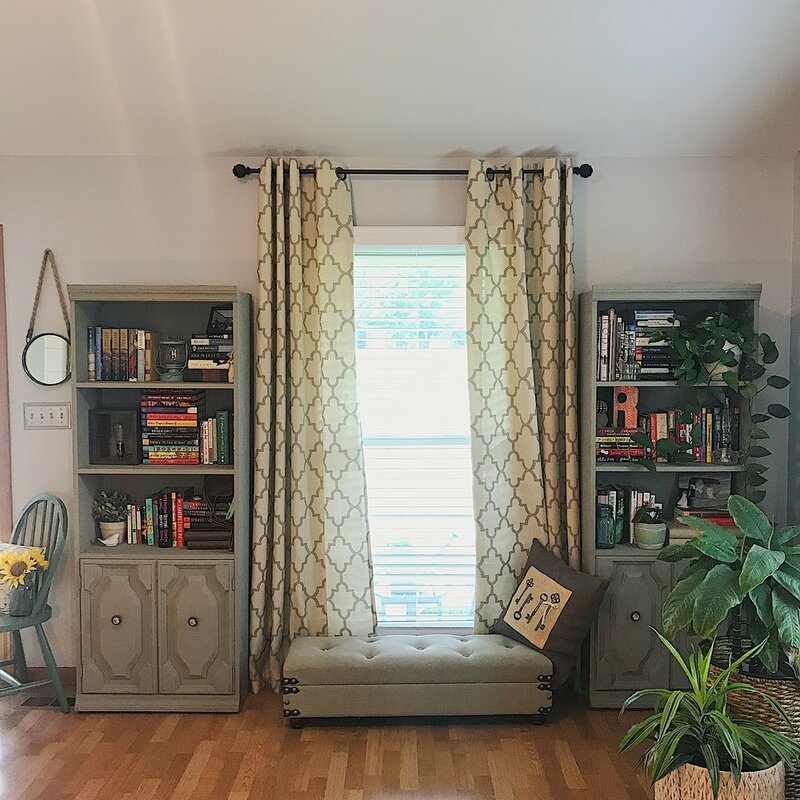 These pictures don't really do the space justice, on a sunny day, when i have the front door open (another project we did, installing the storm door), it is such a light and airy space. Plus I will forever love our table from Louisville Farm Tables! This will be our dining table at the new house, so I'm on the hunt for a few decor pieces to dress it up a little! Changing out those vertical blinds and adding the valance, really opened up the space and allowed even more light in. And that's our living and dining room! I love the space and am really impressed with everything we were able to do to it. This house was our first experience owning a home, and doing any DIY type renovations. I'm really proud of what we were able to figure out and accomplish and it makes me that much more confident of what we will be able to do in our future space!